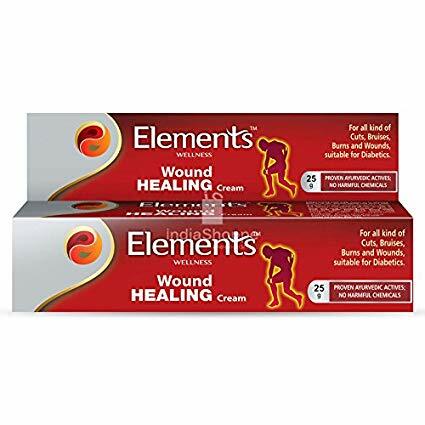 ELEMENTS WOUND HEALING CREAM Elements Wound H | INTELLECT WELLNESS CHEMIST PVT. LTD. ELEMENTS WOUND HEALING CREAM Elements Wound Healing Cream is enriched with natural bio actives that provide anti-microbial activity, moisturising activity, promotion of mitosis and building of skin to help heal the wound and slowly seal the cuts and bruises, reduction of inflammation at the wound site, reduction of pus formation and soothing sensation post use. Elements wound healing cream is enriched with special Ayurvedic herbs known to promote effective wound healing even among diabetes. Why one must use Wound Healing Cream: Because it is much more than Normal Creams Promotes Clotting and reduces loss of blood Enhances cooling activity to reduce pain and inflammation on account of wound Multiply skin cells to quickly close wounds Fewer scars and marks after healing The cream includes a special herb called Manjistha and thus diabetic wounds are healed faster.